Independent whisky bottler Douglas Laing & Co. has announced a new limited edition, cask strength release of Lowland blended malt The Epicurean. Bottled at 58.6% abv, the no-age-statement whisky is said to carry notes of ‘citrus zest, sponge cake and poached pears’ on the nose and ‘vanilla’d oak alongside apple peel’ on the palate. Only 3,000 bottles of the Epicurean Cask Strength ‘Glasgow’ Edition will be released. Priced at £45.99, the blended malt will be available globally from May 2018. The bottle’s label features an image of a gentleman wearing a traffic cone, as a thinly-veiled reference to iconic Glasgow landmark the Duke of Wellington’s ‘traffic cone hat’. Fred Laing, chairman of Douglas Laing & Co., said: ‘The Epicurean’s Cask Strength “Glasgow” Edition takes our hats off to the city’s Duke of Wellington statue. The whisky was created during an event held at the firm’s Glasgow HQ in February, during which eight bartenders and spirit experts experimented with Lowland single malts in order to create a new blended whisky. The winning blended malt, as judged by Fred Laing, was bottled as the new Epicurean expression. 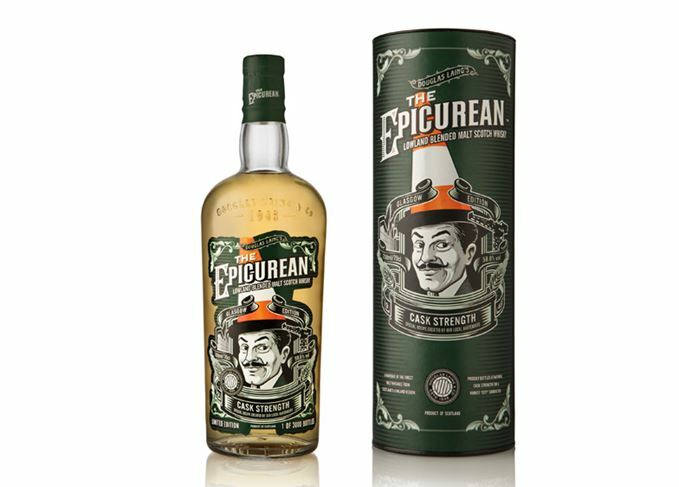 Douglas Laing & Co. first launched the Epicurean in 2016 as part of its Remarkable Regional Malts series, which showcases the geographical variety of Scotland’s whisky-making regions. The company is currently in the process of building a £10.7 million distillery and blending facility on the banks of Glasgow’s River Clyde.